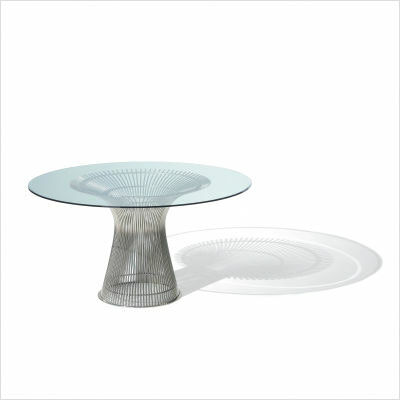 The Knoll Platner Table is one of the most recognized designer round glass dining tables on the market to-day. Designed in the 1960′s by Warren Platner, it has become an iconic, sculptural piece of dining furniture. It truly is a statement piece! The moire effect created by welding metal rods in a curved pattern has given us a truly unique and contemporary table. This dining table does not require any lavish accompaniments or decoration to justify its place in a modern dining room. This table is manufactured by Knoll, who not only have a long standing reputation for superior quality and design, they are a company dedicated to sustainable design, social responsibility and a healthy environment for all. Glass and marble top Platner tables are Greenguard Certified and all Knoll furniture items come with a certificate of authenticity. While the table featured here has a polished nickel base and a glass top, there are a number of configurations and material varieties available in theKnoll Platner Table design. You can have a wooden or marble top and the base is also available in a metallic bronzed finish. A bronzed glass top has also been added to the range. I am kind of stumped here because I love this but I suppose the price of this dining table will not suit everybody’s pocket. I know that if I love something and it is outside my price range this can be a disappointment but on the other hand it means that not everybody will have the Knoll Platner Table and this only adds to its value as a designer statement piece.